LAST year, the oil major Shell released a study which noted that enedavours to check climate change could create a market of up to US $ 50 billion for British businesses over the next 10 years. Shell has, for some years now, made noises about joining in the sustainable business bandwagon. It's another matter that words have not translated into action. There are several others who do not put their money where their mouth is. They continue to parrot platitudes on energy, climate, and sustainability businesses. Every now and then, there is also a new site on the Internet to guide them. 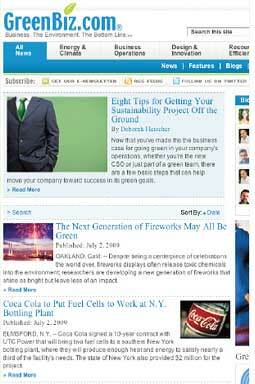 Www.greenbiz.com is another such site.The site is comprehensive: there are reports, blogs, checklists, case studies, and links to organizations, technical assistance and recognition programmes. But whom do such sites serve? That's another question.